After decades of study and planning, the clean-up or radioactive contamination in the community of Port Hope, Ontario is finally underway. The Town of Port Hope, located approximately 100 km (60 miles) east on Toronto on Lake Ontario, has an estimated 1.2 million cubic metres (1.5 million cubic yards) of historic low-level radioactive waste scattered at various sites throughout the town. The contaminated soil and material will be excavated to moved to the LongTerm Waste Management Facility, which is essentially an engineered aboveground landfill where the waste will be safely contained, and the long-term monitoring and maintenance of the new waste management facility. 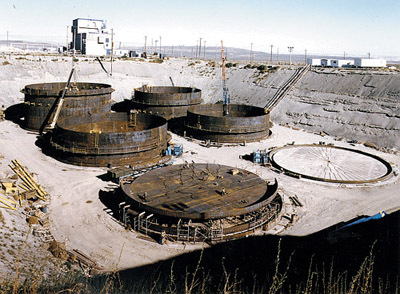 Other historic low-level radioactive waste – primarily soil contaminated with residue ore from the former radium and uranium refining activities of Eldorado Nuclear — and specified industrial waste from various sites in urban Port Hope will be removed and safely transported to the new facility. Port Hope, are a consequence of past practices involving the refining of radium and uranium by a former federal Crown Corporation, Eldorado Nuclear Limited, and its private-sector predecessors. These waste materials contain radium-226, uranium, arsenic and other contaminants resulting from the refining process. The historic waste and surrounding environment are monitored and inspected regularly to ensure the waste does not pose a risk to health or the environment. 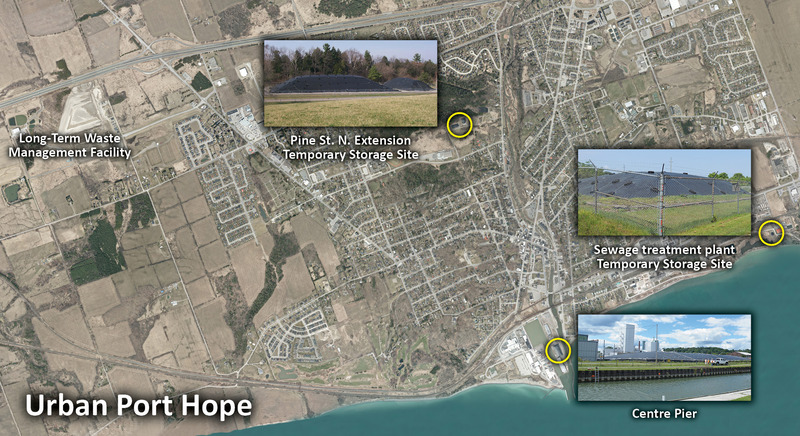 As part of the Port Hope Area Initiative (PHAI) construction and clean-up phase, the waste will be excavated and relocated to the new Port Hope long-term waste management facility. In an interview with CBC, Scott Parnell is the General Manager of the Port Hope Area Initiative, which is in charge of the cleanup. 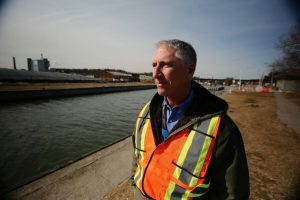 He says that after decades of planning, the first loads of an estimated 1.2 million cubic metres of historic low-level radioactive waste will be on the move. Scott Parnell, general manager of the Port Hope Area Initiative, stands near the town’s harbour. “There’s been a lot of planning a lot of studies a lot of determination into how to approach the work safely, but this will be the first time we will be removing waste from the community,” said Parnell, who has overseen similar operations in Washington state and Alaska. 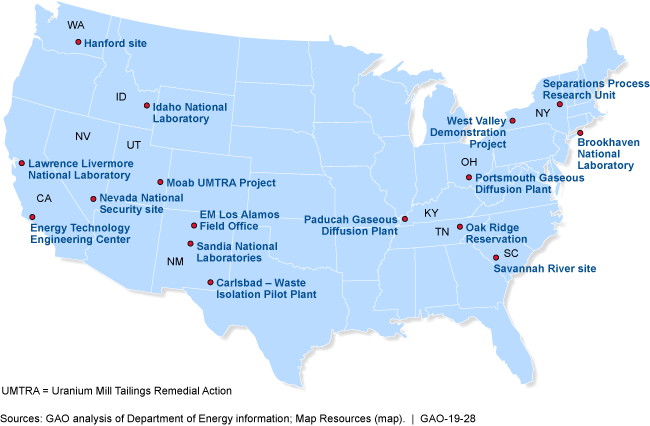 The $1.28-billion cleanup operation is a recognition by the federal government that the waste is its “environmental liability.” The radioactive tailings were the byproduct of uranium and radium refining operations run by Eldorado, a former Crown corporation, between 1933 and 1988. Parnell says that the tailings were given away for free, which helps explain how the contamination was spread through the town. “So, basically they offered it up and it was used for fill material to level up people’s backyards, for building foundations, for those kinds of things. So, that’s how the material got spread around the community,” Parnell said. Parnell says an estimated 800 properties may be affected, but says there’s no indication the low levels of radiation are dangerous. “There’s little human risk associated with the waste that’s identified here in Port Hope,” he said.